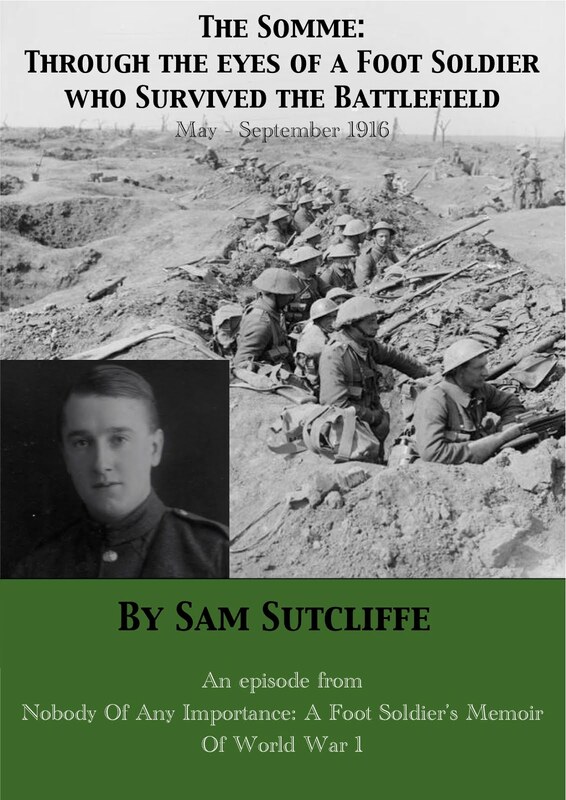 A hundred years ago this month… like tens of thousands of young British men, my father Sam Sutcliffe, 16, a working lad from Edmonton, north London, had volunteered to join the Army and was just starting to learn the basics of soldiering. 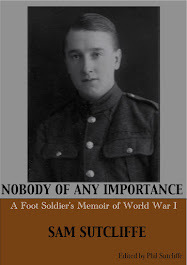 At the same time, joining up involved a whole lot of goodbye to all that — “all that” being the ordinary life of “nobody of any importance” as Sam described himself in the opening paragraph of his World War 1 Memoir. Meanwhile, the war both spread and intensified. Doing modest research as my late father’s editor, I keep coming across events I knew nothing of via history at school or media documentaries or “folk memory”. For example, I’d had the impression that the German Army completely overran “little Belgium” in the first few weeks, encountering hardly any resistance. Not true at all. Tomorrow is the centenary of one key battle starting: the Siege of Antwerp — the Belgian Army defending their second city, with French and British support. They surrendered on October 10 (63,000 Belgians captured and/or interned, 2,300 Brits captured), but fell back to the River Yser where they held the line and never took another backward step, ensuring that the western part of Belgium remained unoccupied until 1918, when it became the basis for their push to recover their country. Sam, his older brother Ted, and their pals Len and Harold all had jobs in the Liverpool Street station area - they travelled in every morning by train from Edmonton Green. But when they all decided to join up they just didn’t turn in to work for the first couple of days and they knew they had to tell their employers what they were up to. A personal appearance was the only way; poor-to-modest homes like theirs didn’t have telephones in those days and the iconic British red public phone boxes didn’t come to the streets of London until 1920. “Having parted with his brother by Garlick Hill in Queen Victoria Street, Tommy strolled into Cannon Street. Already this familiar area seemed to have finished with him. From belonging there — he really had come to like the old City — he now felt rejected. Not working there, he had no business to be there. Here Tommy interrupted to tell of his sudden increase in years and to beg the Sergeant not to speak of this to others in the firm. Whatever his view of such a deception in ordinary times, the Sergeant entirely reassured him now, perhaps because he simply had no interest in anything but his own preparations for leaving. He gave Tommy a gold half-sovereign. A little overcome, Tommy had difficulty thanking him, but when that surprisingly friendly man said, ‘Now you must come along and tell our Scottish director [Currie] about this,’ he felt scared. That man was huge and powerful. ‘He will make me look silly,’ thought Tommy. He was very relieved when the big man listened gravely to the Secretary’s account of Tommy’s enlistment. The boisterousness which Tommy feared did break through briefly as the six foot odd of tough, engineer manhood sprang from his chair, raised a mighty hand and brought it down on Tommy’s back in hearty congratulation. Then, when FCB shook his hand, the Secretary insisted that he should visit the office again before leaving London. Previously, Tommy had felt that few at Lake & Currie knew of his existence, yet now he encountered this great kindness from the top. Saying his goodbyes to the old Sergeant and others, he began to feel regretful that this part of his young life was over. As he walked up the hill again towards the station, the smells drifting up from warehouses and factories along the Thames below seemed almost sweet, homely — qualities they had lacked when working among them was compulsory. Next week: Sam/Tommy says goodbye to his Scoutmaster-choirmaster-piano teacher — the mentor who shaped his youthful character. 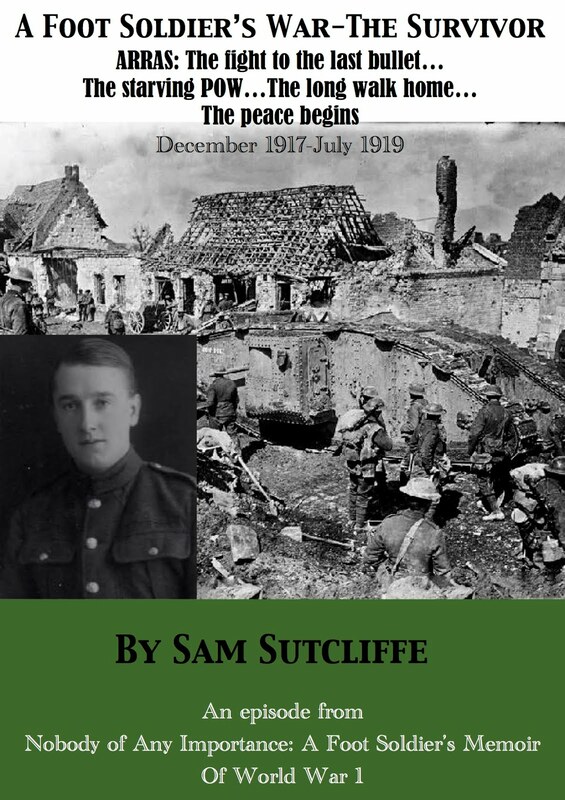 A hundred years ago this month… at 16, Sam Sutcliffe, my father, ceased to be a poor working lad from Edmonton, north London, a junior office boy at a mining company HQ near Liverpool Street station, and became a soldier. Albeit by lying about his age and with precious little idea of what that might entail although the papers had already begun reporting “heavy casualties” on the Western Front – retreats, defeats if you read between the lines. But, still only seven weeks in, it evidently wasn’t one-sided either way as the French-British Allies toed and froed with the germans at the Aisne, then Albert, and the Russians besieged the Austria-Hungary Empire at Przemysl (now in Poland), and a German cruiser sank a British cruiser off Zanzibar… and Sam got his first chance to observe and admire “the calm, efficient manner” in which Army men could “organise a thousand strangers into easily controlled groups”. After a hard evening persuading his parents that he should be allowed to stay in the Army along with his 18-year-old, ergo less-of-a-liar, brother Ted, Sam didn’t really know whether they’d agreed because if they reported him he might go to jail… or because soldier’s pay, 21/- a week, would be so useful to a poor family with four children and a toddler to feed. “Next morning the lads were up in good time, met as arranged, and took the tram back to Bloomsbury… When they arrived they were amazed to see the road in front of the adjacent Royal Fusiliers and Royal Field Artillery depots packed tight with men and hundreds more queuing along another road behind them — all enlisted men like themselves, they learned, and ordered to parade that morning. Harold observed that it would take a mastermind to sort this lot out. But he was soon proven too skeptical. Presently, a uniformed man, stout and ruddy-faced with several chins, mounted a box or chair, they couldn’t see what. In an extremely powerful voice, he called for quiet, then issued instructions. With surprising, almost professional, speed, men on the outskirts of the crowd formed into lines of four across, and the mass became a somewhat ragged column. The rotund Regimental Sergeant Major took his place at the head of it and, with no attempt at ceremony, started marching. Stragglers at the back attached themselves in new lines of four and followed in his wake. Within a few hundred yards, the whole of the leading formation had fallen in step to a man. That almost spherical RSM necessarily set a steady, almost slow, pace. But two streets crammed with men had to be cleared and he’d achieved that very quickly. Had he been dealing with conscripted men, he would undoubtedly have had a problem on his hands. These were volunteers, though. A small, but sufficient, proportion of them had seen service previously and, of the remainder, many had come through various youth organisations, Scouts, Boys Brigades, and others, companies of which trained and marched in every town throughout the land. No new experience for [Boy Scout] Tommy, of course, this marching in step, but the pace, the stride, felt different — longer, slower, heavier, and somehow more exhilarating. On this, their first rhythmic progression as an Army unit, each member carried himself as he believed a real soldier would and kept in step with the man in front of him. No one shouted, ‘Keep in step there, left, right, left!’ None of that. Crunch, crunch, rrrp, rrrp, a steady pace with arms a-swing. Tommy liked the rhythm — and the thrill as he saw the column of men ahead, bearing left round the far side of a London residential square. ‘We’re all in step then,’ he thought. ‘Marvelous.’ He did notice the odd one lose the step and touch the heel of the man in front or trip the man behind — no natural sense of rhythm or perhaps over-eager or anxious. But correction soon followed. Such culprits would later endure the wrath of newly appointed non-commissioned and commissioned officers who had to justify their existence. But today not a word. The houses they passed interested him, and he resolved to take walks in this district, so redolent of London life from bygone days with which he felt he had ties somehow, he didn’t understand why — until, that evening, he concluded that gazing year after year at a picture hung in his parents’ bedroom may have caused his sense of familiarity with the area. It showed a woman, a shopping basket on one arm, descending the several steps from her front door to the street; her young daughter, with a tiny Pekingese dog on a lead, waited on the pavement. Both wore bonnets and the full-skirted costume of the Victorian era. And both, Tommy used to think, looked far too prim and prissy. These wanderings as he marched relieved him, for the moment, from his constant twinges of anxiety and nervous tautness. Would someone suddenly point the finger at him and yell ‘You! Out!’? Probably most of the others had their worries, especially family men. Tommy glanced at the three men along his line, then did as they were doing, stared steadily ahead and kept in step with the thrump, thrump, of all those marching feet. The head of the column had disappeared now as they swung into a wide street ahead, then left through large, iron gates into a spacious sanded area with a substantial building facing them and high walls on either side bordered by roofed walkways supported by stone columns. Inside the gates, the column turned right, then left, until the RSM ordered a halt. The men lined two sides of the square. A separate small group stood apart from, but close to, the head of the column, one of them obviously the senior officer, the others men of various ranks, some in officer’s uniform, but several well-dressed in civilian clothes, mostly bowler-hatted and all carrying walking canes or rolled umbrellas. Next week: Sam/Tommy gives up his day job — and a toff gives him a sovereign. Sam: volunteering at 16 — then how does he tell his parents? 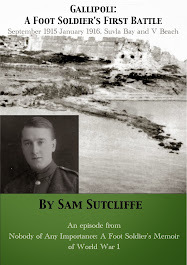 A hundred years ago this month… Sam Sutcliffe, my father, a working boy from north London, and his older brother Ted, both lied about their age (16 and 18) in order to join up — by mistake with the Royal Fusiliers, the “Poor Bloody Infantry”, when they’d hoped to work with the horses in the Royal Field Artillery. Their next daunting task: to tell their parents what they’d done. Meanwhile… the Battle of the Marne — when the French and British Armies’ ended their initial “Great Retreat”, turned and drove the German Army back from within 30 miles of Paris — spun off into the First Battle Of The Aisne, September 13-28. Entrenchment took over from “traditional” mobile warfare and the consequent “Race To The Sea” evolved into a bizarre, horrific, digging contest. Despite lack of experience or training on both sides, the trenches soon stretched 400 miles south-ish from Nieuport on the Belgian coast. And as the Western Front protagonists unwittingly bogged down for the duration, the World War started to justify the name nobody had yet given it, with battles in Ukraine, Poland, Serbia, German New Guinea and German West Africa, which killed or wounded another 350,000 or more people within four weeks. “Crowds of them gathered outside, discussing the day’s events, telling each other they were now soldiers, little as some of them looked the part. Young Tommy had watched and listened with rapt attention to all that had gone on. A fateful day for him, he knew. He needed reassurance now… he looked anxiously along the street for his brother, Len and Harold. With relief he spotted them and they set off for home, each probably thinking very different thoughts regarding the immediate future. [Being a little older] Harold and Len, at least, would have no explaining to do when they reached home, while Ted might be in some slight difficulty and Tommy could face grave trouble. Instead of taking the long walk to Liverpool Street, they spent 4d of their pay on the tram fare back to Edmonton. They went on top and chatted away about their personal experiences that afternoon. Quite sure of themselves, the three elders felt confident they would be able to explain to their firms that they had done the right thing, being prepared to fight for their country — the popular phrase of the time. Tommy would have to tell his firm as well, but being such a junior he didn’t imagine that losing him would mean anything to them. The first thing, though, he knew, was to get home and tell Ma what he had done. Even so, he probably didn’t appreciate the shock his news would cause her. When they went indoors she commented that they were home earlier than usual. Then out poured their news and not, to Tommy’s surprise, in any apologetic way but with something like pride. Watching mother’s face, the boys saw various emotions aroused. She and father being politically of a Conservative persuasion and quite firmly patriotic people, she did not immediately protest or reprimand. She did point out that Tommy was much too young to think of being a soldier. That concluded it, though; before any decision was made, she would have to talk with father. Later that evening, when father returned from work and mother told him the news, the brothers awaited the outcome of their discussion. Eventually, their parents called them together and told them they could agree to Ted staying in the Army, but they would have to get Tommy out. At this, Tommy played his trump card. He said he knew, strictly speaking, he’d done a very dishonest thing, but pointed out that his motives weren’t bad — and, finally, that he didn’t know what prison sentence would be inflicted on him for making a false declaration regarding his age… In conclusion, he pleaded with his parents for permission to carry on as a soldier for a time, at any rate, and prove he could do the job for which he had volunteered. Father talked of the physical strain a boy could suffer in trying to do the tasks expected of full-grown men. Still Tommy begged to be allowed to try. It may seem shocking that Tommy/Sam should feel money played a part in his parents’ letting him go to war — but, as the Childhood section of his Memoir relates, the family had been very poor for many years. * On £ and ps, that’s £1 5p, about £105.95 at today’s values. Next week: Their first march around London as volunteer soldiers and how the public reacts. Ending the Allies’ “Great Retreat” after Mons just 30 miles from Paris, the French Army drove the German Army back, forcing their abandonment of the Schlieffen Plan which contained no provision for strategic withdrawals, much less defeat. So they dug trenches and, unwittingly, laid the foundations of The Western Front, war as immobile as a slaughterhouse – it would still be there waiting for Sam in 1916, after Gallipoli, when his Battalion was posted to France. The Marne cost the French and the Germans half a million casualties between them, dead or wounded, and the much depleted British Expeditionary Force a further 13,000. Perhaps you can imagine the sinking feeling in Tommy when he heard this. Was he going to be left on his own with the diminishing number on the train journey to an office where all was gloom? Was he going to do that? No thinking required. ‘I’m coming with you,’ he said. “[Tommy] meant to stick with his brother and the others if possible – although a glance in the mirror convinced him that he looked almost childish compared to them. Far removed from chaps who needed to wield cutthroat razors in order to look presentable. “I’m going to be left behind. They’ll be off and away without me,” he feared. “… the line of men slowly inched forward until Tommy, in his turn, came face to face with the doctor. An elderly man, thin and not far from unkempt, he worked under great pressure and at speed. ‘Open your mouth.’ He looked in. He pulled down the lower lids of Tommy’s eyes. Glanced into his ears. Put a stethoscope to his chest. He held Tommy’s scrotum in one hand and said ‘Cough’. Again he applied the stethoscope to his chest, then said ‘You’ll do’. Onwards to a long table where several uniformed clerks were filling in Attestation forms, asking for all the usual details, including age. ‘19,’ said Tommy. Here came the catch. ‘Date of birth?’ Tommy had that worked out. ‘July 6, 1895.’ ‘Any birth marks?’ Then the clerk read to him a declaration that all these things were true and said, ‘Sign here!’ All that completed, he was told to go upstairs and wait. He found himself in a large hall where, amid the crowd, he felt reasonably safe. Rightly or wrongly, he thought some men looked surprised when they noticed him. The serious face he wore – or tried to – would, he hoped, conceal his inward wavering. Useless to show uncertainty. From now on, he was a man among men and would have to march long distances and carry heavy equipment and a rifle and ammunition. All this, he knew for sure, would tax his boyish strength, but he remained determined to go ahead. Pleasure at seeing the other three in the hall rid him immediately of forebodings and he listened to their accounts of the medicals and so on and shared their joy in having at last achieved their intention of becoming soldiers. ‘Artillerymen you mean,’ said Tommy. Next week: Tommy/Sam and Ted tell their parents what they’ve done.